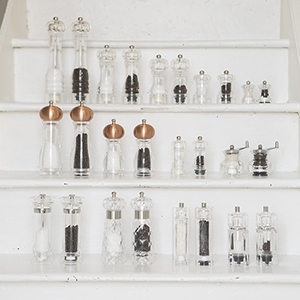 T&G specialises in the design and manufacture of salt and pepper mills and leads the market in terms of function, quality and design, offering a combination of classic and more innovative design. All CrushGrind® and Classic mill mechanisms carry a lifetime mechanism guarantee. T&G’s award winning CrushGrind® mechanism is the ideal choice as it allows you to effortlessly grind not only salt and pepper but also, using the same grinder whole dried herbs and spices. T&G truly believe in the importance of their mills, peppercorns like coffee beans taste best when freshly ground! Why are T&G ceramic mechanisms harder than steel? 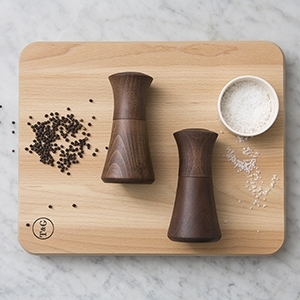 The earliest salt and pepper mills were developed in wood and used traditional metal grinders. Today the mill market is quite diverse with mills made from steel, acrylic, porcelain, marble and of course wood. Traditional grinders made from a variety of metals can still be found in many mills, but salt mills will usually have plastic mechanisms to avoid corrosion. However the use of ceramic is rapidly expanding. T&G’s Classic mills are available in a choice of different materials including crystal clear acrylic, hevea and beech wood, copper finish and coloured wood. AT&G now lead the way with all of our peppermills incorporating ceramic grinding mechanisms and have a fully adjustable mechanisms. There are no metal grinders to corrode and no plastic grinders to wear out. Ceramic mechanisms are ideally suited to grinding peppercorns as they are harder than metal and also will not corrode or oxidise food. 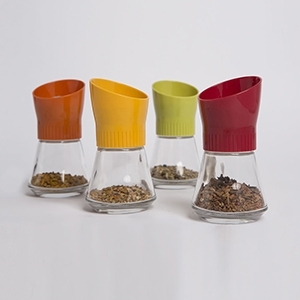 While peppermills with a metal mechanism can only be used for grinding peppercorns, T&G's peppermills can also grind salt, pepper and whole dried herbs and spices. When new, add a spot of cooking oil to the top of the metal spindle where it meets the adjusting screw, this will prevent oxidisation and keep the thread in good working order. It is advisable to repeat this occasionally throughout the working life of the mill. Mill bodies can be kept clean by wiping them over with a damp cloth. Wooden models will benefit from an occasional application of mineral or T&G wood oil, to enhance the appearance and prevent the wood from drying out. The mechanisms on T&G mills both CrushGrind® and Classic carry a lifetime mechanism guarantee. Mineral oil for wood treatment is far superior to vegetable oil and is the product T&G recommend for your wood products. (Braziliensis – wood from the rubber tree) this is a white tropical hardwood from the rubber tree, which is planted mainly for natural rubber production. The major rubber producing countries are Indonesia, Malaysia and Thailand which together account for approximately 74% of the total plantation area. Hevea is very ecologically sound. After 25-30 years, when the trees are approximately 15 inches in diameter, they are unable to produce sufficient latex for conversion by the rubber factory, so they are felled and replaced by young trees. There is the added value of a very useful and attractive timber, which is hard and stable, reducing the likelihood of warping. 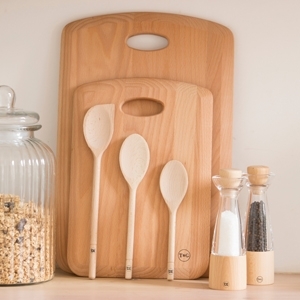 The beautiful finish and light grain looks great on kitchen accessories as well as boards. Hevea can be successfully colour stained for co-ordination and waxed or oiled to seal the wood enhancing its appearance and prolonging its “working life”. Care Instructions: All T&G Hevea products have been sealed with a non-toxic protective lacquer to enhance the appearance and to help prevent the absorption of water when washed. Hand wash in warm water with mild detergent, do not soak, dry immediately. Not dishwasher safe. As with all Woodware, hevea and acacia can dry out with use, so an occasional wipe with T&G’s food safe wood oil does much to restore the original natural appearance. Acacia is a tree with roughly 1300 species around the world and is easily recognised by its umbrella shaped canopy. The scientific name for the species of Acacia T&G use is ""Samanea Saman Merr"" often known as the Rain Tree and in US and European circles as ""Monkey Pod"" . It is well appreciated with environmentalists because of the enormous amount of CO2 this tree can absorb - very useful when planted along roadsides. This species, popular for its timber, can be found over much of South East Asia. It grows at a fast rate (0.75 to 1.5m annually)and it is also interplanted as a shade tree with other crops such as coffee or cocoa. In Thailand, it is cultivated in many areas, especially the North, East and Centre much planting is along roadsides for producing shade. It can grow to around 25m high and the canopy will be wider than the height but in the last 15-20 years Acacia trees have been cut leaving the root so that the tree sprouts again as with our native Willow which we call ""Pollarding"" and T&G assume that is why this timber is also called ""Black Wattle"". In some areas of Thailand villagers still plant new Acacia trees as they are popular hosts to an insect called ""Laccifer Lacca Kerr"". This insect produces a scarlet, resinous secretion often used as food colouring and is similar to our ""Cochineal"". It is also applied to dyes and lacquers as a colourant and is often referred to as ""Shellac"". There is also a certain amount of self-seeding but in certain provinces villagers are encouraged to plant Acacia trees from seeds supplied by officers of the Royal Forest Department of Thailand to increase the local resource. The timber has been referred to as ""Black Wattle"" or from its appearance ""Black Walnut"". T&G consider Acacia a rich coloured wood with a wild grain. Very hard and most suitable for use in the home from cutting boards to chairs. Care Instructions: All T&G Acacia products have been sealed with a non-toxic protective lacquer and are oiled to enhance the appearance and to help prevent the absorption of water when washed. Hand wash in warm water with mild detergent, do not soak, dry immediately. Not dishwasher safe. Is the same wood but the finish is treated differently. Every one of our new rustic boards is completely unique. 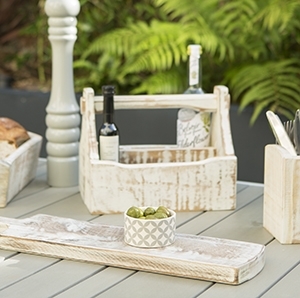 These beautiful rustic boards vary widely in their appearance, making every one extra special and individual. 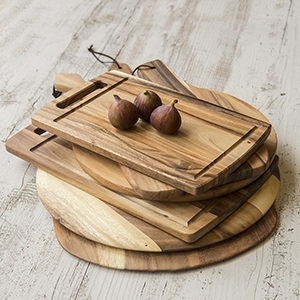 Our rustic acacia wooden boards/platters are ideal for preparing and serving food. On trend with today’s fashion, casual lifestyle and individuality. 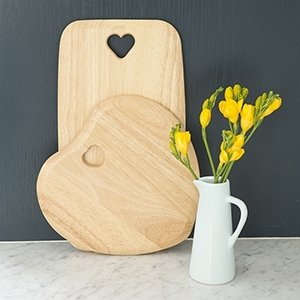 As with all Woodware, Acacia can dry out with use, so an occasional wipe with T&G’s food safe wood oil does much to restore the original natural appearance. 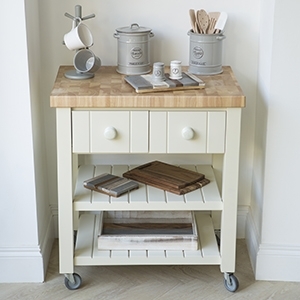 Care & Use: All T&G Rustic Acacia products have been oiled and do not have any lacquer. Hand wash in warm water with mild detergent, do not soak, dry immediately. Not dishwasher safe. Acacia wood is a rich coloured wood with a wild grain. It is a very hard wood and most suitable for use in the home for kitchen accessories. The T&G Nordic range has a rough sawn finish and is available in two colourways – a natural finish which has a non-toxic protective lacquer and a white finish which has a non-toxic white painted finish. Both these finishes are suitable for contact with food. Care Instructions: Hand wash in warm water with mild detergent, do not soak, dry immediately. Not dishwasher safe. A beautiful warm wood, a northern temperate hardwood from a medium sized tree, averaging 30m high. Beech is a pale cream colour with a straight grain; it is fine textured with small spindle shaped markings. 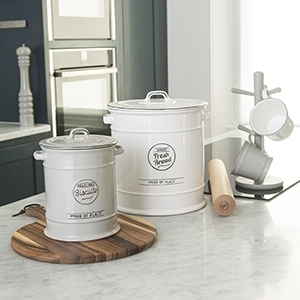 It adapts well to humidity and is ideally suited to the production of kitchen utensils such as spoons, spatulas, rolling pins and chopping boards. In Europe it is the most commonly used timber for the production of food preparation products and kitchen furniture. Nearly all T&G beechwood products are European FSC® sourced. Beechwood can be successfully colour stained for co-ordination and waxed or oiled to seal the wood enhancing it’s appearance and prolonging it’s “working life”. Care Instructions: Hand wash in warm water with mild detergent, do not soak, dry immediately. 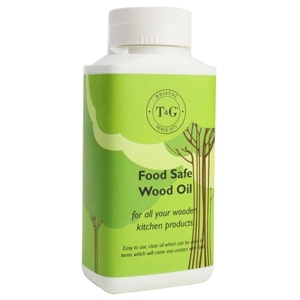 Oil occasionally with T&G Food Safe Wood Oil or mineral oil. Not dishwasher safe. Cork is in fact the outer bark of the cork oak, which is grown commercially in a narrow belt stretching through Portugal, Spain and the South of France and along the North African coast. The bark is stripped only in summer and the first stripping must wait until the tree is about twenty years old. Subsequent strippings take place every nine or ten years. 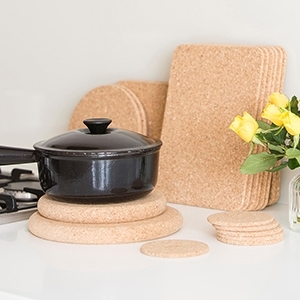 This makes cork an ecologically acceptable product, as it is one of the few materials, which regenerates itself. T&G’s ceramic ranges are designed to be used and enjoyed with confidence. We test items to ensure that we deliver quality items that are functional, durable and safe. All T&G’s ceramic ware is easy to clean either by hand using conventional hand-wash detergents or by using a dishwasher. Dishwasher safe: all T&G’s ceramic items can be washed in a regular domestic dishwasher. Always follow your dishwasher manufacturer’s specific instructions. 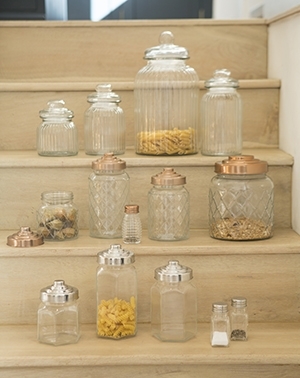 T&G’s glass storage items are produced from recyclable soda-lime glass, which is annealed to ensure its durability. 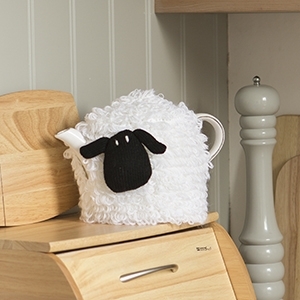 They are ideal to add style to your kitchen. Marble is a crystalline form of limestone. It is a completely natural material with a cool polished surface, which is ideal for pastry making, storage and food presentation. Marble is not suitable as a cutting surface and is not for use with acidic products such as lemons. As black marble is rarer than white some items are slightly more expensive. As a natural material variations should be expected. Care & Use: Wipe clean with a damp cloth and dry thoroughly. Acid foodstuffs can pit marble as can prolonged contact with water. Do not use marble as a cutting surface. Not dishwasher or microwave safe. Our textile ranges are all designed by T&G and are made form 100% cotton. Care & Use: Wash before use. Do not tumble dry. Do not bleach. Do not dry clean. Wash dark colours separately. Fabrics may shrink slightly after first few washes. Keep away from naked flame. 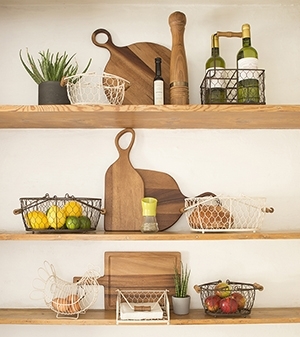 Our Provence wireware collection of unique and charming storage solutions for the kitchen is produced from powder coated steel wire to give a beautifully rustic appearance. The pieces are very decorative, but also robust and functional. Care & Use: To clean simply wash in warm soapy water and dry immediately. Not safe for use in dishwasher. Hevea and Acacia: Every trolley is suitable for cutting and chopping. However, as surface cuts and scratches can spoil the appearance, most people use a chopping board placed on top. 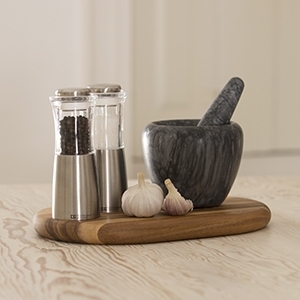 Wooden surfaces are ideal for food preparation as they are sympathetic to knives and are hygenic to use. Care & Use: To clean simply wipe over the surface with a damp cloth or wash in warm soapy water, do not soak. As with all woodware, Hevea & Acacia can dry out with use, so an occasional wipe with T&G’s food safe wood oil does much to restore the original natural appearance. T&G is able to provide spare parts for a large number of our products e.g. a broken pestle from our pestle and mortar sets or a cap or knob for our pepper and salt mills, or a lid for a store jar. 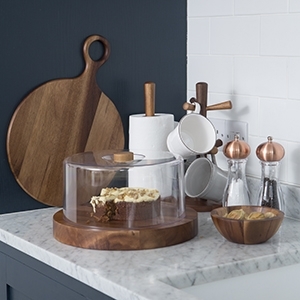 We are usually able to replace accessories such as cheese wires that are fitted to our boards and we keep stock of glass bowls, domes, dishes and the various ceramic accessories provided with our entertaining ranges.